Luxe Suffolk Tipi Weddings and once in a lifetime events. 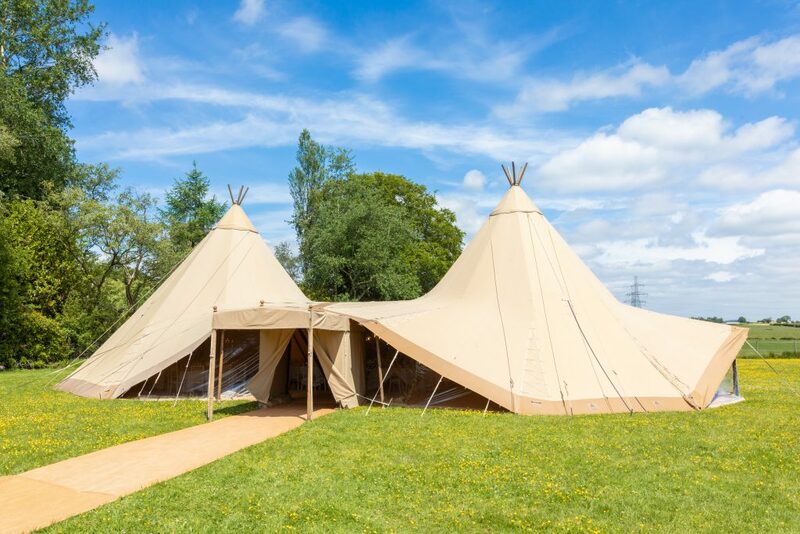 Suffolk Marquees are pleased to be launching our new range of stunning British Made Tipi’s for 2019. Our marquee business, celebrating it’s 10th year has a fantastic reputation locally for providing beautiful structures for wedding and once in a lifetime events. As a small family business, Michelle & Ian along with their experienced team take great pride in ensuring every detail is perfect for your event. The business has grown by providing excellent personal service with beautiful structures whilst still offering competitive pricing. 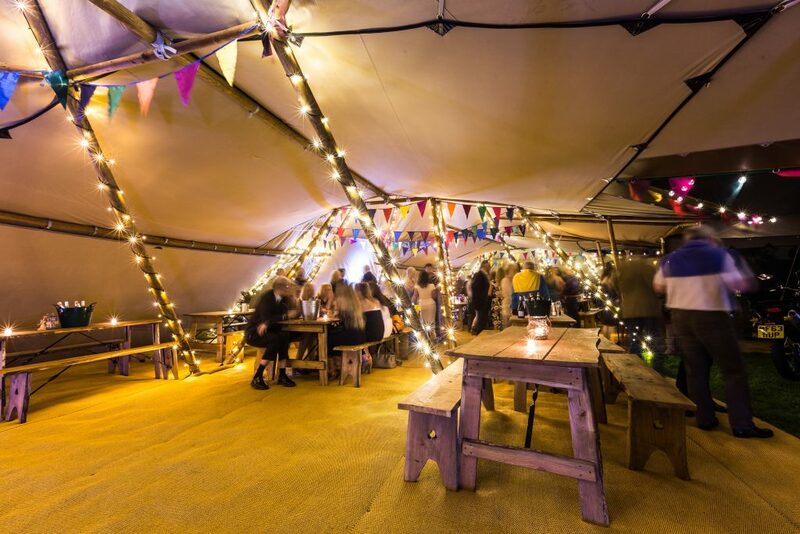 With every large marquee and tipi installation overseen by the business owner, nothing is left to chance. 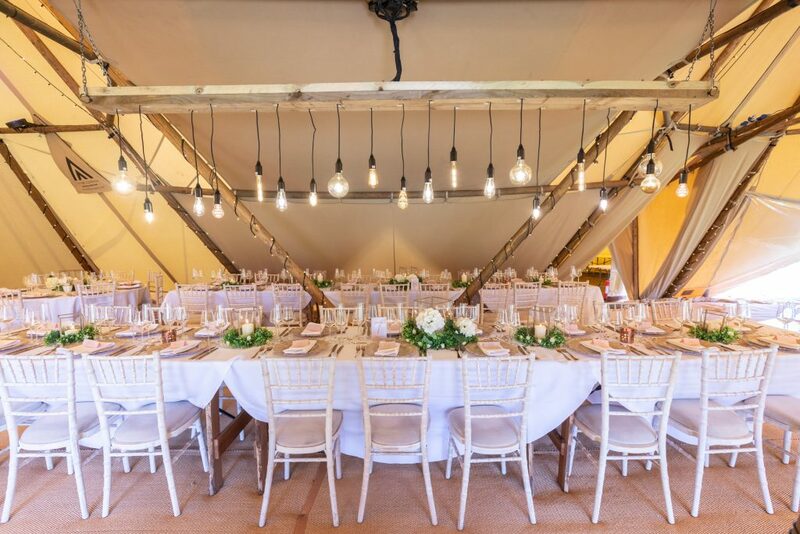 Each of the giant tipi’s can comfortably accommodate up to 70 seated guests. 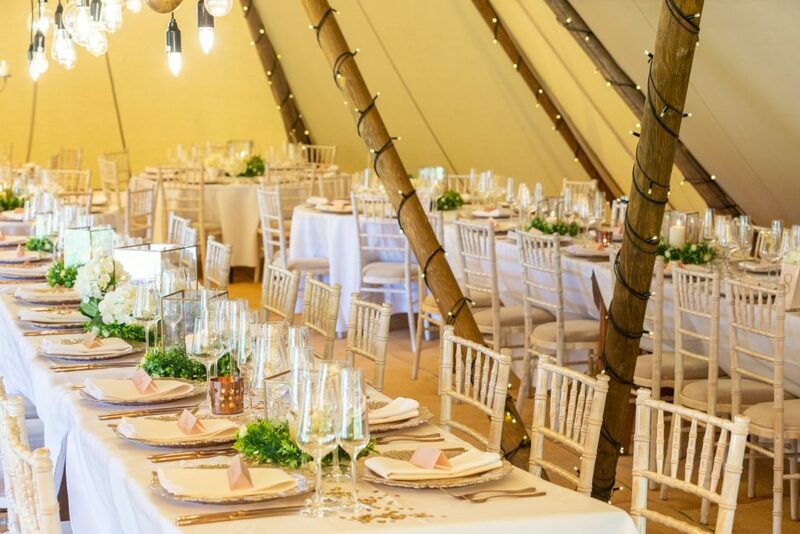 They are ideal for an informal birthday party for 50 in a single tipi or a luxe tipi wedding for 150+ with all the trimmings in 3 tipis linked together. Any structure can be supplied with or without furniture, décor and lighting to suit your vision. Whether it’s a formal wedding breakfast with a 4-course meal that you have in mind, we can supply a suitable glamorous vintage look to create the perfect atmosphere. Wooden, carpeted floors in colour of your choice, round tables and chivari chairs. Perhaps, it’s a more informal chic-casual festival feel you are looking for in which case our new rustic trestle tables and benches would suit for that classic feast style dining experience. 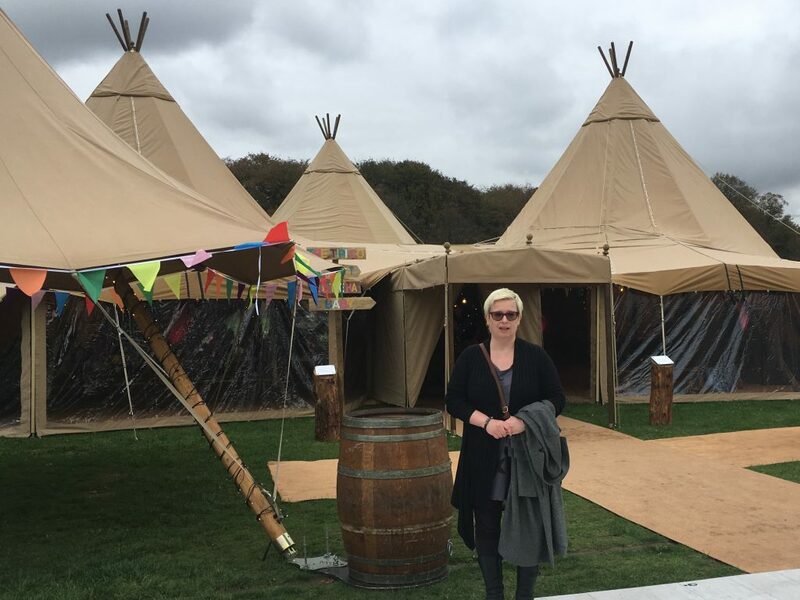 The look and feel of a natural wooden tipi frame along with the traditional canvas style canopy offer a beautiful alternative to our frame marquees and with ease you can personalise your tipi with our bespoke lighting and décor options. Lit lighting planks & ladders with pendants and exposed bulbs or illuminated lanterns offer stunning lighting options – all are fully dimmable to create the perfect dreamy ambiance. Use LED fairy lights as a canopy or wrapped around the wooden tipi frame along with coloured uplighters will ensure the informal lighting becomes simply magical after dark. 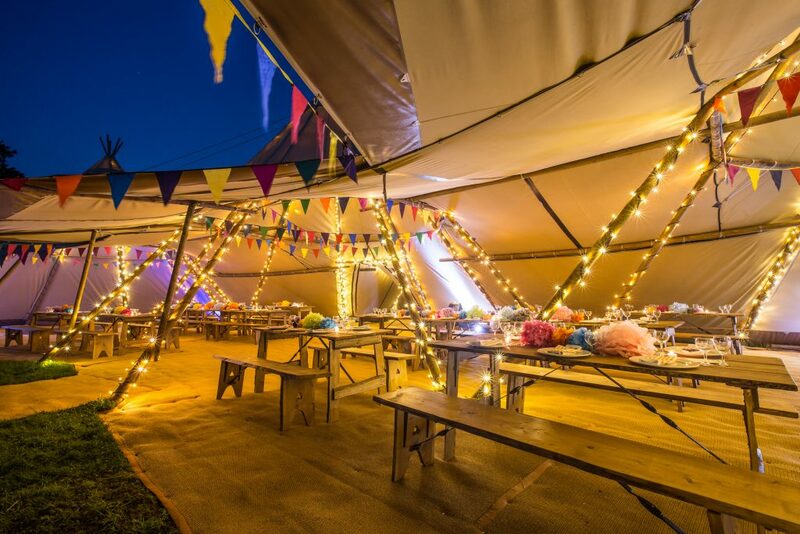 Lighting does not have to be confined to the inside of the tipi, festoon lighting around the tipi or as well as our fabulous festoon walkways using our shepherds’ crooks to guide your guests are a dreamy addition to the tipi. 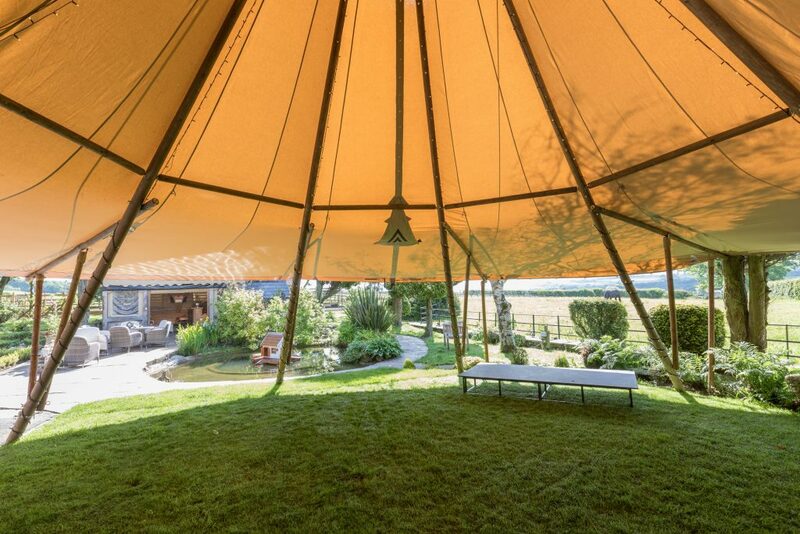 Our tipis offer all year-round wedding or event space. In Summer with the sides open are light and airy but in Winter with panoramic windows are delightfully cosy. Our tipis use thermostatically controlled heating, venting in warm clean, odourless air for those chilly autumn evenings keeping your guests toasty warm without a smoky smell. Haugley park Wedding Showcase 3rd March 2019.